Children learn more between the ages of one and six than they do at any other time of their lives. Many parents know that it’s the formative stages – even more than those spent at secondary school – that really help to develop a child’s capacity to learn. It’s astonishing to consider how many skills a toddler is trying to master simultaneously: how to walk steadily, how to communicate with his parents and siblings, how to eat unaided and how to make sense of his world. Good-quality early education for two year-olds can really help to develop and complement all the skills a young child is learning at home – and research shows that children are more likely to enjoy and do well at school if they’ve experienced high-quality early education. 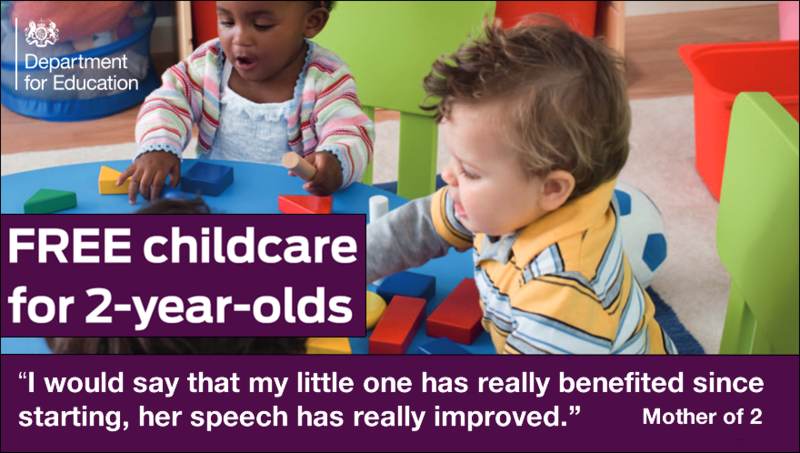 The benefits of good-quality early education extend far beyond learning the alphabet or counting to 10. Children can practice their newly-acquired language skills with new friends, develop their imagination by exploring new toys (and learning to share them!) or perfect skills they may be practicing at home, like learning to put their coats on or take off their shoes by themselves. And the benefits extend to parents, too – because many mums and dads want to work and do work, all while balancing the demands of home life. Knowing their little boy or girl is being encouraged to try new things and develop new skills even when they’re not with them can give them the assurance they need to go back to work, take a college course to refresh their skills, or even get ideas about how to help their child play and learn. 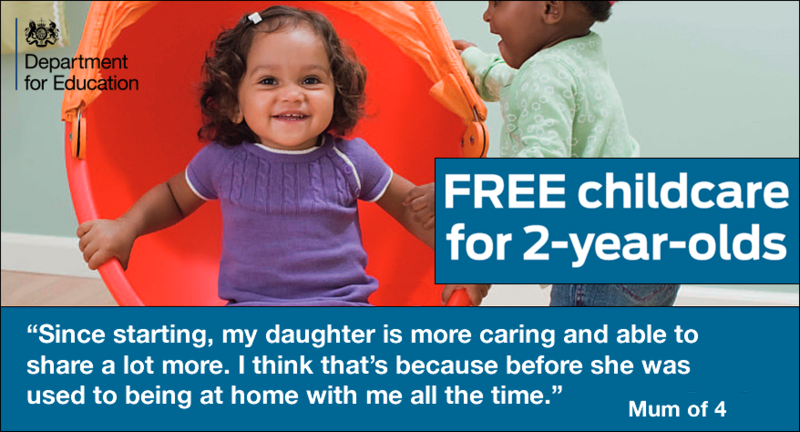 Early learning for two-year-old places are free for parents. They are funded by the Government and can be taken in a range of good quality regulated providers – including childminders which many parents value for their more home-like feel and smaller groups. Parents can, if they choose, purchase extra hours in addition to the 570 hours per year (subject to availability at the setting where their child takes up their early learning place). They should not be asked to pay additional fees e.g. : for services such as activities or lunchtime meals as a condition of taking up a place. If they are already receiving child tax credits they should inform HMRC if taking up a funded early education place changes the amount they pay for childcare. However, families should always be better-off taking up a funded place as they are totally free. 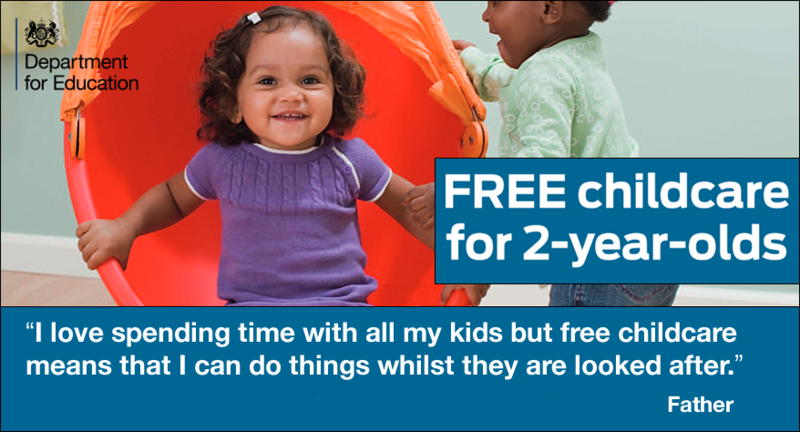 More information can be found at www.gov.uk/freechildcare . 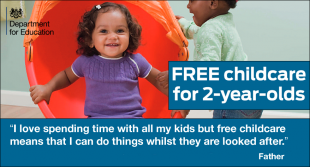 Parents can also ask their local childminder, nursery, playgroup, children’s centre or primary school whether they offer funded places for two-year-olds. 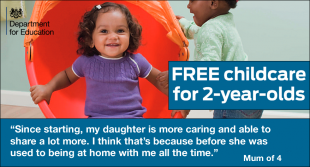 Early learning for 2 year olds is not available for all and the above post makes it sound like it is !